Each project may consist of specific tasks. Also, as a company, you may have some generic services you offer that can be used in more than one projects. To create tasks select More -> Tasks-> Add. Hourly rate: Rate of the task's billable hour. Applicable for projects whose billing method is set to 'task hourly rate'. 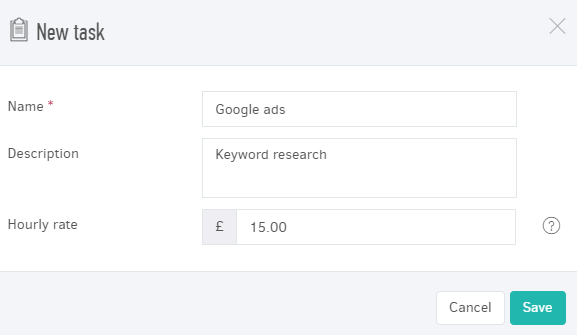 If your project's hourly rate is the same as the task's, you don't need to fill it in here. If your task's rate is different you can designate it here. Once you click Save, your task is ready to use. 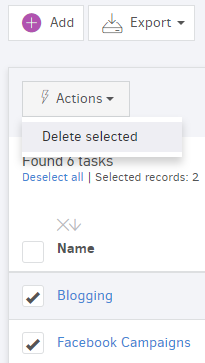 From the tasks list, you may select the ones you wish to delete and click Actions -> Delete selected. Can I delete tasks that have been associated with time entries? No, you cannot delete tasks that have saved time entries. In order to delete them, you need to delete all time entries first, from the time entries menu. Can I edit tasks? Which fields? Yes, you can edit your tasks and all of their fields.